"solenoid assembly, starter motor" and "starter solenoid relay"
Could you tell where I can find the "starter solenoid relay"
If fitted, it’s on the inner wing just behind the battery. 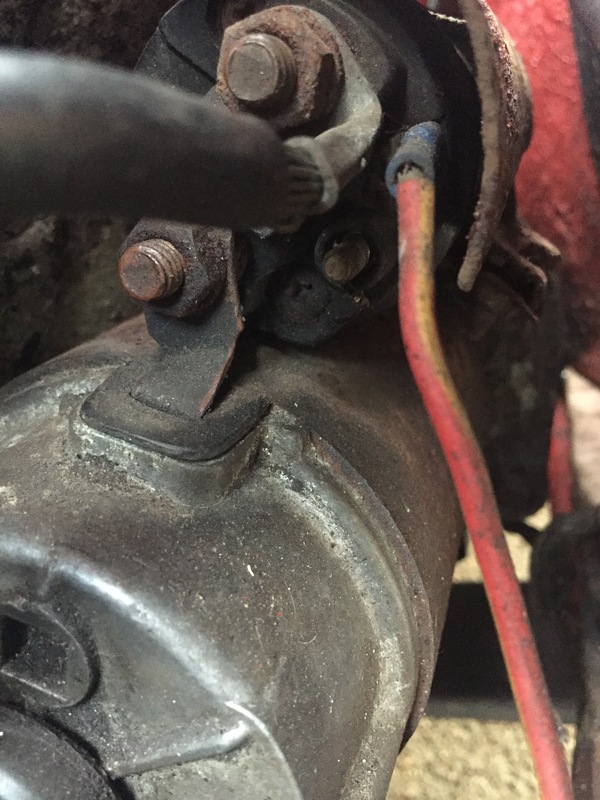 When Reliant changed the starters to pre-engaged type, they left the old solenoid on the wing (presumably to use up remaining stock of looms) and just ran a new wire to the starter. I’ve removed mine as it’s not really needed. They used it an a starter inhibitor relay - somewhat overkill but my ‘74 5a (Auto) had one. Was on the “shelf” somewhere by the wiper motor if I remember correctly. Battery > fuse box > wiper motor > starter relay IIRC? I have a battery kill switch where the relay used to be. I don’t think the auto really needs a solenoid, you could fit a normal relay? Edit - you can see it in this photo from Dave Poole’s sporting-reliant site. Yep - except on the auto it had the white/red wires for the starter solenoid where you’d expect to see the battery cables attached. I remember it because it seemed odd. Main battery cable went straight to the (pre-engaged) starter as normal. When I fitted a later-type starter motor to my Coupe I wasn't too keen on a permanently live high-amperage feed running between the block and the manifolds so I left the remote solenoid in place and put a link on the starter between the main feed and the solenoid connector. It works fine and gives me a little peace of mind - not that I'm a worrier! Mind you, I do have long-branch manifolds and I think the cable is closer to them than the normal single down-pipe. Eric, I'd give those connections a clean and remake the solenoid connector.